Born in El Paso, Tx. and raised in Boyle Heights, Ca., Fabian Debora has been creating art since his childhood. 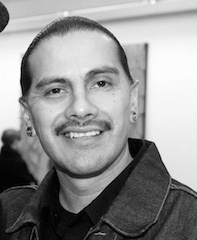 Beginning his art career in 1995 as a member of the East Los Angeles Streetscapers, Fabian was mentored by many Chicano artists and muralists and was introduced a creative expression in all forms, from graffiti to murals to sketching and fine art painting. Over the years Fabian has created murals throughout East Los Angeles and continued to develop his style through work on canvass. He has been showcased in solo and group exhibitions throughout the United States, including Santa Barbara, Ca., Los Angeles, Ca., and Kansas City, Mo. Brooklyn NY. Fabian is currently a Director of substance abuse services and programming/counselor and mentor at Homeboy Industries in Los Angeles and works in collaboration with LPAN (Latino Producers Action Network). As a Director of Arts Department and instructor between community artists in Boyle Heights and students in the classroom.